Students all over Mississippi University for Women are trying to reach one similar goal, and that is to find out who they really are and what they can really do. The ways they go about doing it are often similar. Some students are trying courses that are outside of their majors to see if they will find interest in multiple things, and others are joining social clubs. To piece together who they are and what they want to make out of their college experience, they often compile lists of what they want to accomplish during their time as a student. Students were asked what they had written down on their own bucket lists. Some goals are academic driven. “My bucket list would have one major goal, and that would be to graduate with A’s and B’s. My fiancé, Justin Davis, is moving to Kentucky, so that is where I will be doing my future job searching at. I want to get my Bachelor of Science and nursing degree, and I hope to get accepted into MUW’s nursing program next summer,” said Alley Smith, a sophomore nursing major. Most goals are related, but some can be out of the ordinary. Some goals are more philosophical. “My bucket list is really simple. I just want to find myself. I want to know who I am and what I am made of. I want to have an idea of myself. College is all about finding out who you are, and I intend to do just that. I would also put sleep on my bucket list because I don’t get much of it due to studying,” said Allison Jones, a sophomore theatre major. Other goals are more traditional. “Well that is an easy question. The top goal on my bucket list would be to stop being so broke. If I can find a way to not be so broke while still attending college, I will be a happy guy. I also want to put propose to my girlfriend on my bucket list because that’s one of my top priorities,” said Graham Young, a junior theater major. “I want to study abroad, so that would be on my bucket list. I will get a chance to this summer with the honors program, so I will be able to check that off soon. They are taking me to Scotland. I also want to go hiking in some far off place sometime, so I’ll add that to my list. I might get to climb a mountain while I’m in Scotland, so I might be able to complete my bucket list before I graduate,” said Allie Burt, a sophomore culinary arts major. “I just want to take a spontaneous trip somewhere on the map. I just want to close my eyes, point my finger and go to wherever it lands on the map. I want to be able to pack up some clothes and just go on an adventure for a week. That is it. That is exactly what is on my bucket list,” said Katie Welch, a senior theater major. 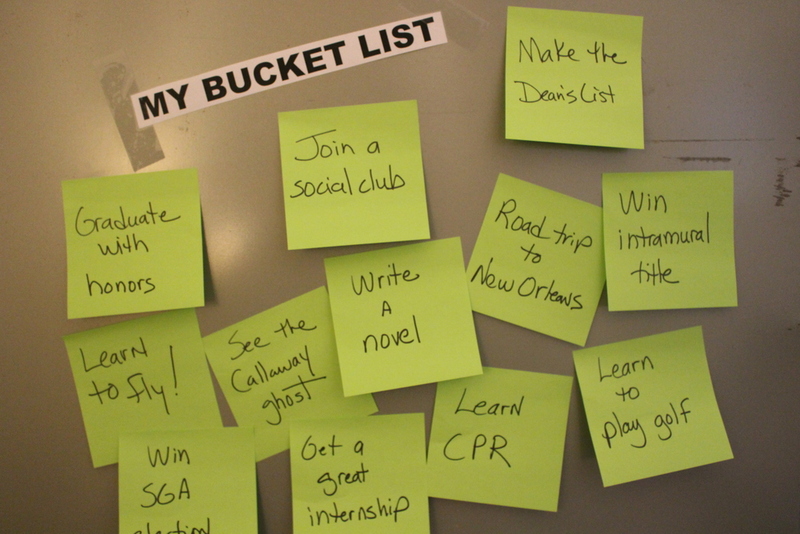 A bucket list is a great way to prepare a student for his or her future. By setting short-term goals for themselves, they are slowing working towards their overall big goal. The students here at MUW all share one big goal, and that is to graduate. All of them have short-term goals that they hope to accomplish before graduating and dreams they want to watch become reality. There are three things a student will always need and that is a pencil, a book and a bucket list ready to be checked off.